There are over 300 million people using Twitter every day. And they’re tweeting a TON – it amounts to 6,000 tweets per second. While there’s no doubt that Twitter can be an effective platform for your business to reach your target audience, breaking through all of that noise is quite the challenge. Yet, we all know businesses and Twitter power users that seem to have it all figured out, don’t we? They seem to know exactly how to find great content to share on Twitter. Some of us tweet, and we’re lucky to get a couple of people to like it. But when the pros tweet, their posts seem to explode with likes, retweets and replies. Why is that? Well we’ll tell you in this post! And then outline some specific, actionable recommendations for you to find content to share on Twitter. Before you jazz up your tweets, it’s important to make sure that your profile itself is optimized. …Many of whom will review your profile before determining whether they want to follow you. Have a great-looking Profile Image – It doesn’t have to be a professionally-produced headshot, but it does need to be a real, recent picture of you. Use a unique cover photo that tells a story – no, not a literal, written story, but an image that says something about you and, ideally, something that reinforces your professionalism. Mine, for instance, is an image I created in Canva that merges my love for Star Wars and LEGO with some information about what I do. Off of your profile, it’s a good idea to make Twitter your focus if you really want to grow your presence. Include links to your Twitter profile in your email signature, a follow button your website, and in your blog post author bio’s. …It’s great technique for getting exposure and generating more followers who are specifically interested in reading more from you. Now that your profile looks fantastic (good work! ), it’s time to think about what you’re tweeting. While it’s easy to just say, “share great, engaging content” – that’s probably not very helpful. So, let’s go over some basics and then dig into what “great” means here. First, like every other social platform, Twitter and Twitter users love visuals. That is why you need to make sure that you’re regularly sharing video and images, including GIFs, if appropriate to your niche. Second, discoverability and engagement are very dependant on your use of hashtags. Remember earlier when we said there are 6,000 tweets every second? Hashtags are how savvy Twitter users tune out the noise and focus on the tweets that might be interesting to them. Wait. Interested isn’t a strong enough word. Your audience needs to love your tweets. They should look forward to reading what you have to say next, and be eager to like, retweet and reply to your updates. They should be excited to engage with you. That’s the ideal, so let’s talk about how you get there. Twitter, like other social networks, can’t be someplace that you just happen to share to when you think of it. If someone looks at your profile and sees that you haven’t tweeted in months, they’ll be less interested in following you. And, the more often you tweet and those tweets get seen due to hashtags or retweets, the more opportunities you’ll have to attract new audience members. So tweet regularly. If you’re just starting, that might be 1 – 3 tweets per day as you slowly ramp up. Power Twitter users might tweet 25 – 50 times per day. But it’s important to note that they didn’t start by tweeting that much. It’s as important to share quality content as it is to be careful not to tweet too much too fast. Your audience and tweet schedule has to grow organically over time. Be careful not to quickly rip off a tweet or settle for hitting the tweet button on an article and simply share whatever the default is. Are you packing as much meaning and interest as you can into 140 characters? Have you included a provocative image? Hashtags? Are you missing an opportunity to @mention another Twitter user? Like anything else you put in writing and share publicly, take a step back and try to read what you’re saying objectively. Does it really make sense? Is it truly relevant to your audience? It’s also important to remember that Twitter is a social network, not an advertising medium. It’s understandable that most bloggers and businesses will use Twitter to broadcast their content. However that can’t be the only thing that you do or users will quickly tune you out like a bad commercial. One way to do that is to ask questions that cater to your audience and get them interested in engaging with you. Of course, you need to make sure that you’re paying attention and respond to the answers you get. When you’re ready to take this technique to the next level, participate in and host your own Twitter Chat. So that we don’t appear to be only interested in ourselves and our own content, it’s a great idea to retweet other users. Distribute helpful content to your audience that you didn’t have to write. Associate yourself with other influencers, improving your image. Make a positive impact on other influencers. The caveat here is that, in order to do all three of those things, you might need to avoid mainstream publications. I could tweet CNN articles all day long and CNN would hardly take notice. Plus, it’s content that everyone else can easily find so it’s probably not too impressive to my audience. However, when I tweet content from peers and colleagues, it’s content that a good portion of my audience likely hasn’t seen yet. …And those influencers surely see that. It’s appreciated at every level. Finally, do make sure that you respond to your audience! This is as true on Twitter as any other network, though it’s challenging to scale. …Particularly if you’re using tools like Triberr or JustRetweet to spread awareness. Personally, I reply to every Direct Message and Mention that’s a question or comment requiring a response. And for those who are sharing my articles, I tend to look for those that shared it manually and thank them. That way, I still spend some time every day tweeting Thank you! over and over. But it’s worth it. Now, notice that I haven’t specifically told you to share quotes or cat memes or tips… or any other details about what you should be actually saying. I’m afraid that’s up to you. Every business and audience is different, so it is imperative that you test for yourself and find the right mix for you. Beyond what to share though, we can talk about where to find great content to share on Twitter. First, look no further than your own backyard. What articles and blog posts have you published that are still applicable today? We call that “evergreen” content and they make for great tweets to be shared over and over again. Personally, I’ve set up my queues so that I can tweet a link to an article I’ve previously written 8 – 10 times per day and go a whole month before I repeat myself. For everything else, there’s Post Planner. …Posts and articles and images that have already shown to be popular. This is an important point that I want to stress. …And those methods are OK, except for that major difference – the content isn’t rated. When I see an article in my RSS feed or on another website, I have only my own intuition to gauge whether or not my audience might actually be interested in that piece of content. 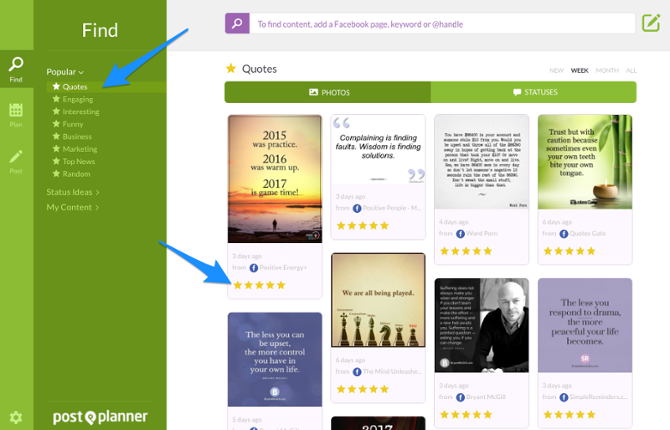 Post Planner gives each discovered piece of content a 5-star rating so that you easily know how it’s performed so far. Within Find you can choose to look at Quotes, Engaging content, Interesting content, Funny content, Business content, Marketing content, Top News or Random content. Within each you’ll find tabs for Photos, Articles and/or Statuses, depending on the type of content and what’s available. So, suppose I wanted to begin setting up tweets of great quotes. 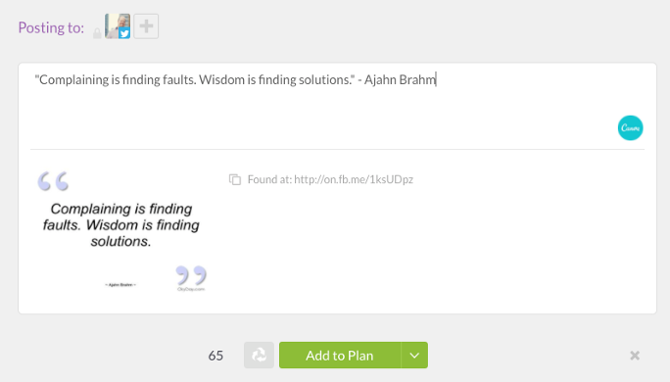 I’d go to Find, click on Quotes, and start looking through the great image quotes that Post Planner found. If I wanted to share text only, I’d click on Statuses. And I could choose to change the default date range from the past week to New or Month. Post Planner shows you where each piece of content was discovered, and if you hover over the star rating you can see what the actual response was. Each time I see a great quote image, queuing it up is as easy as hovering over the image and clicking Share. I can share the image as-is, or type in the quote text, or say whatever I want. I have already set up a sharing schedule for my profiles that includes specific timeslots for images. So, I’d simply click Add to Plan and this post will be queued up to share at a later date. This is an easy, and effective, way to find content to share to Twitter, including quotes and questions you might ask your audience. Plus, by using Post Planner, you can decide in advance how you want to schedule and space out your posts and types of posts. For instance, maybe you want to share one quote or question a day, two images, and three linked articles. Your Post Planner Plan will help you arrange that. Even top-performing surfaced content may need some massaging to be optimized for Twitter. So. let’s run through what makes for high performing tweets. First, length is a factor. …But you also want to make sure that when and if someone wants to retweet you, they can without making a mess of things. Now that images and links no longer count against your 140-character limit, you have a little more room to maneuver. Most of the studies available today were done before that change, so just try to leave 15-20 characters available. …And link preview tweets will perform poorer than tweets with an attached image or GIF. And attached video will likely perform the best. This is something that, again, you’ll need to test for yourself, as every audience and every piece of content is different. But once you’ve determined that, say, Images and Videos perform best, then it’s up to you to make sure that most of your tweets, if not all, use that format. Third, the use of hashtags, is something we mentioned earlier and it bears repeating. Most of your tweets should include 1 – 3 hashtags. You can experiment with including them within the main text of the tweet versus adding them at the end – that may or may not matter to your audience. But you don’t have to make it a guessing game as to which hashtags to use. Do some research in advance and determine which hashtags are relevant to your industry and are being used and followed by your target audience. Then make a point to focus on using those hashtags whenever appropriate. Finally, @mentions, particularly of influencers in your niche, is a powerful technique that you should employ regularly and appropriately. We don’t want to @mention someone just to get their attention, but rather, when it makes sense to do so. Talking about a brand or influencer within a blog post and then mentioning them in the tweet is a great example of not only a great tweet, but great influencer marketing. Many influencers are happy to retweet such tweets. You can also quote influencers or share their content, always making sure to @mention them on the posts. Above all else, you need to pay attention to how your tweets perform and learn from them, as well as watch how others in your niche leverage Twitter. Twitter’s analytics can help you identify the best performing tweets. They can also show you how your profile is doing overall in comparison to previous months. If you want to easily compare two or more tweets, simply add them to a Twitter Moment so you can see them side-by-side and gauge engagement. Those tweaks and improvements will help your tweets stand out. And if you’re regularly sharing great, high performing content that tools like Post Planner have identified for you, you’ll see the results in how your audience responds.